This family is generally considered the most primative. The family includes the largest crickets of them of all - the 'Wettas' of New Zealand. They are usually seen at night at wetter times of the year. One of the most striking species are the 'Giant Forest Crickets' (Papuaistis and Penvalva spp.). Some species have white patches where their long legs bend upwards, and locally are more commonly known as 'white-kneed crickets' (above). 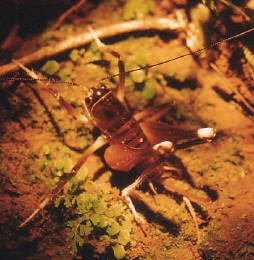 These large brown crickets with very long antennae and when disturbed hop about in every direction, usually landing on the person who is most scared of them.